With our impending division unit coming up next week, I have been hearing many utterances of fear and hopelessness popping up in the classroom. "I can't divide" was heard one too many times for me last week. Even though they actually CAN divide, and have been proving they CAN divide throughout our multiplication unit, I knew they needed a little reminder ... a reminder about growth mindset. 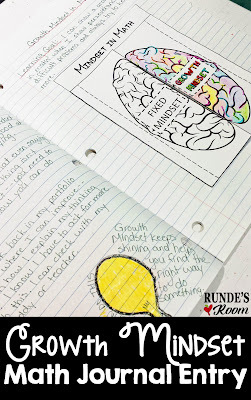 We did a lot of lesson on growth mindset at the beginning of the year, and we've been continuing to discuss it, but I wanted the students to have a tangible reminder of it ... in their math journals ... where they can flip to it whenever I (or they) think they need the reminder. 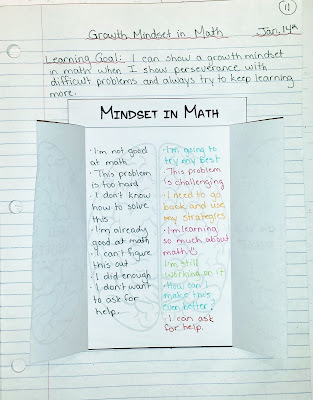 For this entry we didn't have a learning goal straight out of the curriculum - instead, we came up with more of a definition of what growth mindset looks like in the math classroom. 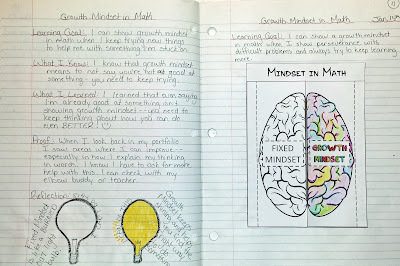 We discussed what we already knew about growth mindset - and some of the students were surprised that saying, "I'm already good at this ..." or something along those lines was an example of fixed mindset. Many of them thought that only negative phrases showed fixed mindset. We talked about how thinking you're already good at something may keep you from continuing to work harder at it and looking for ways to improve. Light bulb moment. For our journal entry, we made a foldable tool of a brain. On the top flaps we left the fixed mindset side in black and white and colored the growth mindset side to make it more appealing - what we would want. Under the top flaps we wrote phrases that correspond with each of the mindsets. After we came up with a fixed mindset phrase, we talked about how we could turn it around to show growth mindset. Again, we used black for the fixed mindset phrases and color for the growth mindset phrases. We did a traditional "left-side of the page thinking" for this entry - talking about what we already knew, what we learned, proof, and reflection. For the proof I had students go back through their math binders and portfolios to look for areas they need to keep working on - maybe they need to go back and work on something more, or look for areas they can improve, or where they could ask for help ... etc. 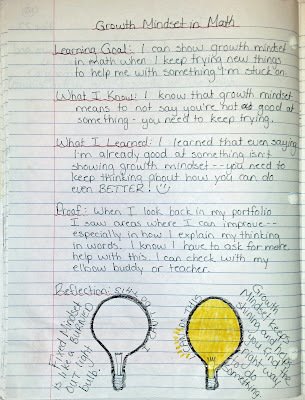 Going back through older work was a real eye opener for them - and many DID see how far they have already come - reinforcing that growth mindset that they will continue to learn things if they keep working at it. If you're interested, you can take a peek at this lesson in my TpT store by clicking HERE or on any of the pictures in this blog post. Stanford University offers a free online course for students on Growth Mindset specifically in regard to math. I have done this with my sixth graders with a lot of success. Thanks for the journal entry to reinforce this concept. Math has really been a big issue among students, whether in primary or college level, including the students from http://www.lordofpapers.com/paper-writing-service. This growth mindset will help a lot of students cope up in Math.